Do the current state of so-called “vampires” make you depressed? Of course I’m referring to the clean-faced, self-aware, neutered, poor excuse for a vampire that pollutes society these days. By neutered I mean it’s like they had their balls severed sometime during the course of their lives, a trend that was completely unheard of in vamp-culture pre-1992. Legends like Bela Lugosi must be rolling in their coffins while they look down at these twerps. David (Lost Boys) would be spitting up his noodle/worm/rice/maggot Chinese take-out combination plate – if he was still immortal enough to see how our culture defines what a bloodsucker is. Not only is TNUC + Big Mike’s DEATH TO FALSE VAMPS mix a 42-minute, Frog Brother-assault on these weaklings, it’s also a celebration of what it means to be a true-blue creature of the night! The chosen video vamps featured on this mix definitely aren’t driving Volvos and shopping at Urban Outfitters. They ride custom choppers and wear whatever post-apocalyptic, ratty, lone warrior garment they can get their claws on. They also don’t listen to Maroon 5 and hang out in the school library. Our bloodlusty demons are more likely to seduce your sister in the hallway and take her to a Ratt concert on the beach. 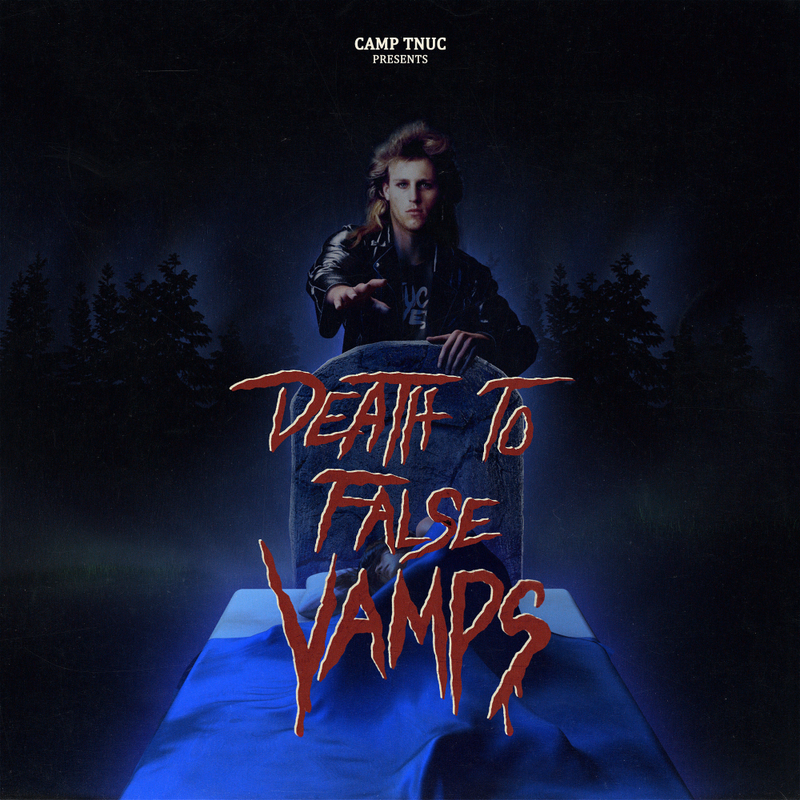 So grab a bottle of blood wine, drag your combination TV/VCR out to the bonfire and and join us for ‘CAMP TNUC IV: DEATH TO FALSE VAMPS. ← FROM THE DESK OF GIANNI ROSSI. The dry ice. The ultra neon. The pounding synth metal. The biker boots. More dry ice. As a long time supporter of Uncle T and his amazing 80's metal mixes, this is my least favorite one. When I read through the track list I was a little disappointed. I get the whole “Lost Boys” themed which could be why, since you had to use songs about Vampires, etc. I was just hoping to hear some monster 80's camp fire metal. Dennis Michael Tenney/Witchboard – “Bump in the Night”, etc. Oh well, there's always next Halloween! Loving the new Artwork, keep it up Uncle T! Thanks disciples! Your support throughout the years cuts to the core of me. Sorry to hear that Marko. We wanted to stray away from the “camp” theme because we did that last year. The current state of vampires is so dull and cheesy. This needed to be done. No worries Uncle T! I totally understand. Today's youth is lost and America/Hollywood is trying to weaken their minds and make them neutered. But with the help of your blog, there's still hope to save them. I'm not going to lie Uncle T…the more I listen to this mix, I love it and crave it more! My first impression wasn't so great of it, but now it's been on repeat for a few days now. This Mix is getting downloaded as soon as I get home, I must state the fact that I will always feel that “I Still Believe” is possibly one of the most powerful songs ever created. Love all this stuff!